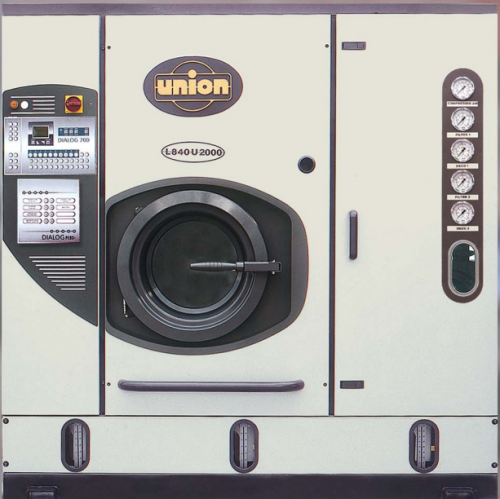 Union dry cleaning machines are packed with high-performance and exclusive features that guarantee you the finest cleaning possible at the lowest cost. The ergonomic design produces exceptional cleaning as well as convenient and easy access to all components for quick maintenance. The newly designed L&P 800 Series offers a two-tank space saver “SlimSpace,” in addition to our “Full Size” three tank models. Our machine sizes range from 35 lbs. to 165 lbs. * Note: All Union perchloroethylene drycleaning machines are approved by New York City MEA. Dialog Computer has 20 factory-set programs to manage virtually every need as well as customize on-site to your liking. Updated software keeps accurate, progressive accounts of operation performance and routine maintenance on a time, day, and date basis. Standard on all 800 Series machines is the Dialog Plus. We're proud to implement the latest computerized technology for drycleaning. You now have flexibility to control individual settings in each program without adjusting the factory's settings. Newly designed, drying chamber and refrigeration unit saves energy and reduces your operating costs. Specializing in Dry Cleaning Excellence Union S.P.A is the largest manufacturer of textile dry cleaning equipment for use with perchloroethylene and all Class III-A solvents (Hydrocarbon, GreenEarth™, and other alternative solvents). I thought I would take a minute and let you know how impressed I am with your service department and Tom. A year ago or so, I had a wonderful conversation with Tom on union Dry Cleaners and the Union Dry Cleaner we currently own, he was pleasant, not pushy, and very generous with his time and information. He followed up with me here recently after I was having some issues with my dry cleaner. I am completely impressed with your service department as well. I have only had to use them twice in the last two years, both times they have been outstanding! Especially Zach, who I believe even called me on a weekend to try and help me. But he was great about helping me figure out my problem, which is exactly what I needed. I can tell you that the service means more to me than anything else! and it will be the reason when the time comes for me to buy union.